All dressed up and ready to go to any party, this breathtaking bouquet has style to spare. Beautiful contrasting colors and blossoms are so perfectly arranged in a Satin Cylinder vase, the effect is both fanciful and fascinating. 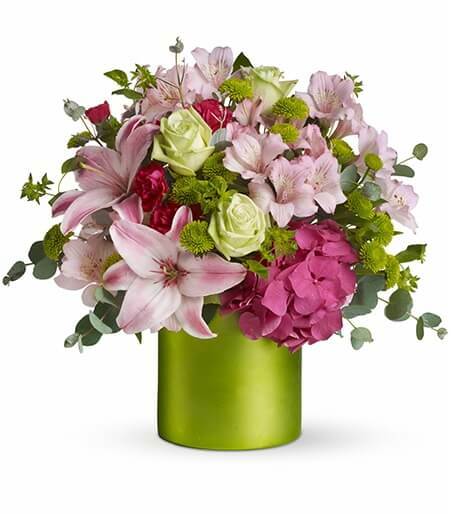 Pretty pink hydrangea, brilliant green roses, pink asiatic lilies and alstroemeria, hot pink miniature carnations, green button spray chrysanthemums and more are delivered in a dazzling green Satin Cylinder vase.